Large, but not as large as Shanghai or Beijing, Nanjing is mainly accessible via a large bus network, although there are several subway lines. All public transit closes at ten or eleven. The city is home to many historical sites, such as the city wall, the Nanjing Massacre Museum, and Sun Yat-Sen's mausoleum, alongside many karaoke joints and expat bars. Nanjing is considered one of China's furnaces: in the summer, temperatures regularly top 100 degrees. However, the weather October through April or May is quite cool. Exciting things can happen in Nanjing -- things like appearing on TV or mastering kung fu. Nanjing’s bus and subway systems are extensive and cover most of the city. In case you’re in a hurry, taxis are fairly easy to hail and start at a base fare of ¥11.00 ($1.65) for the first 3km and ¥2.40 ($0.36) for each additional kilometer. Traveling outside of the city is also convenient with two high-speed railways, Nanjing Railway Station and Nanjing South Railway Station, and an airport, Nanjing Lukou International Airport. Nanjing Massacre Memorial Hall: This museum memorializes the 300,000 victims who lost their lives during the Nanjing Massacre in 1937. As the exhibition hall is half underground, visitors feel like they are in a tomb as they walk past pictures, sculptures, artifacts and documentary films that highlight the atrocities committed during the occupation. Although a heavy subject, this memorial is a tasteful tribute to the victims and we highly recommend a visit. Purple Mountain: Purple Mountain stands at a height of 1,467 feet and is home to over 200 heritage and scenic tourist sites. Those who are up for a semi-challenging hike can choose to climb uphill, while those who would rather save their energy posing for pictures can take a cable car up the slopes. Sun Yat-sen Mausoleum : The Mausoleum is nestled in the Purple Mountain so you could cross both sites off your list in one day. Sun established the Republic of China after the conclusion of the imperial era and is thus considered to be the “Father of Modern China.” Pro-tip - This is one of the most popular tourist spots in Nanjing, so make sure to schedule your visit around peak tourist times; you don’t want the only view you have to be a sea of people. 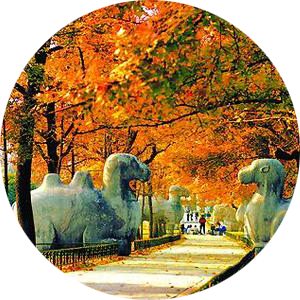 Nanjing Confucius Temple: Confucius Temple or Fuzimiao is located along the Qinhuai River, which gives visitors an opportunity to take a boat ride through a branch of the Yangtze River. You can spend a whole day here exploring its cultural attractions, eating famous local dishes and walking through the underground shopping havens. If you miss big western brands like ZARA and H&M, Xinjiekou (downtown Nanjing) is the place to go. Wanda Shopping Plaza and Deji Plaza are mega malls that ooze luxury and quite frankly, put our malls back home to shame. If you get tired of shopping, movie theaters and restaurants are conveniently located within these grand buildings. For those looking for a deal, there are plenty of bargain marts in the city, most notably Fashion Lady and Confucius Temple. Fashion Lady is located under the Xinjiekou subway station (take exit 8) and is home to hundreds of vendors who are open to haggling. For souvenirs to take home, we’d recommend Confucius Temple. If you’re lucky enough to find the entrances to the underground malls housed within Confucius Temple, you’ll find affordable goods that will delight your friends and family back home. When it comes to grocery shopping, you’ll have plenty of options. Locate your neighborhood farmer’s market (a lot of neighborhoods in China have year-round outdoor vendors with fresh produce at great prices). If you’re looking for fresh fruit at a reasonable price, we’d recommend buying from local fruit stands as opposed to larger supermarket chains like Carrefour. If you’re craving cheese, cereal or other western comfort foods, head to Times Grocery located in the Gulou district on Yunnan Road. Although pricey (a box of cereal will be ~$8), your taste buds will thank you for treating them to a little piece of home. Salted Duck is typically ordered as a dish to share. Since Nanjing is often regarded as “China’s duck capital,” there are many different duck options. Yet, the Salted Duck dish prevails as the local favorite thanks to its non-greasy taste and crispy skin. Stinky Tofu can be found on many street corners in the city and you’ll most likely smell the food before you see it. Although many foreigners find the fermented tofu’s odor to be intolerable, please be open to new experiences (its taste is a lot more muted than its smell). Sweet and Sour Mandarin Fish is a must-try in Nanjing and is a feast for the senses. First, the fish is de-boned, then the meat is sliced into grids so that the final product is a beautiful work of art. Hairy Crab is a popular dish in Nanjing, especially during the fall (mid-September to mid-October) when they’re being harvested. Although the meat is sweeter and tastier than larger crabs, the highlight is the hairy crab’s rich, buttery paste. Since each crab is fairly small, the eating process takes quite a bit of patience, so be prepared. Nanjing Pussycat Café: This one is for the cat lovers. Drink tea/coffee and get some tasty desserts while having access to a dozen or so adorable cats—a perfect way to spend a lazy Sunday afternoon. There’s no entrance fee but you do have to purchase an item from their menu in order to stay. Language Cafes: Language cafes serve as great meeting places to get introduced to new people while polishing your Mandarin skills. Since everyone who attends is learning a language, these are judgment free zones. These cafes have become extremely popular in China; past EAs have participated in several of these events with upwards of 50 attendees. Do a quick web search of cafes/restaurants that are currently hosting language exchange events. Shanghai Road: This is a good street to visit when you’re craving western comfort foods like burgers, fries and pizza. If you’re craving a sandwich, do yourself a favor and visit Skyways, home of the best sandwiches and macarons this side of the Pacific. 1912: This is Nanjing’s premiere bar district and the city’s hub for nightlife. Located along North Taiping Road, the area gets extremely crowded after 10pm. Notable bars include: Mazzo, the Red Club, Scarlet Bar and Blue Marlin Bar and Restaurant.